“Do You Have To Get Your Blood Sugars Under Control Soon? Do You Wonder How To Do That Now That You Have Diabetes? I had an AHA! Moment, medical professionals really do make it hard for people to control their diet while living in the real world and trying to get by in the day-to-day life. A taxi driver can’t just stop and eat lunch and have all the right foods, and he has to have choices to make a better plan. It’s important to help people find a meal plan that fits around real life and daily life – he can’t eat regular meals, he has strange hours and must eat on the run. You need someone to explain to you in simple terms about a diet that is for real people living in the real world. 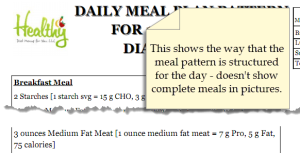 You need to control your blood sugars… How does this meal plan help you? Designed as a meal plan for real people living in the REAL WORLD who need the flexibility of being able to adjust to their circumstances on a daily basis. It meets the “guidelines” to make it a diabetic diet, but it does not limit you to only certain foods. We understand your problems and have created your diabetic diet meal plans to meet your need for a variety of foods, shopping lists, nutritional information, and diet compliance! We have meal patterns for the entire day – and lists of choices for breakfast, lunch and snacks. Then we have dinner recipes that are new every week. By following a diabetic diet menu, you can make your doctor happy and help meet your medical care goals – which should mean less complications and medications in the long run. It will save you time – it will give you the items you need to eat to succeed at controlling your blood sugars and staying healthy. It will save you time – it will give you the items you need to eat to succeed at controlling your blood sugar. the flexibility of choosing from the different food types (fruits for example) and create your meals for the day. Add those items to the shopping list, and you are ready for the week. 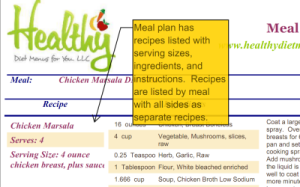 A typical meal plan might include a meal with a dinner entree and sides (between 1-3 side dishes) that are both starch and vegetable items for a group of 4-6 people. The dinner meal will be no more than 475 calories and 50 grams of carbohydrate for all the items. 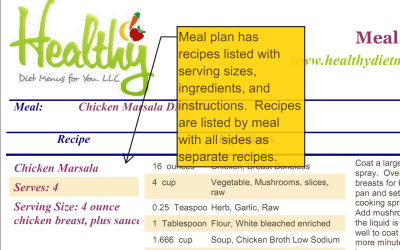 The meal that you get has the recipe for all the items in the meal and nutritional information is included as well. What if you don’t need to feed 4-6 people – cut the recipes in half, or save part for the next day at lunch or snack. Our plans also include a pattern for the entire day with amounts of foods to eat in different categories, broken down into meals. 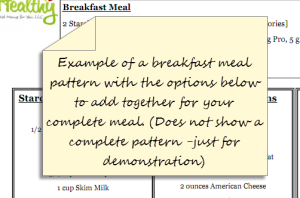 In addition, to complete the plan – you get a sheet with your breakfast and lunch meals that have suggested amounts and foods that fit into the different categories. It’s as simple as adding the meal together using the sheet and you are always ready to eat and keep your blood sugars in check! Order now for your solution and if at any time you decide it’s not for you, we will refund your unused weeks. You subscribe monthly to our meal plan, and we provide you with a new set of 7 meals per week with all of the recipes, sides, grocery lists, and nutritional information. A MONEY BACK GUARANTEE! At any time you can cancel your subscription and get the remaining amount of weeks you have paid for refunded. Try it for a couple of weeks, a month or several months – if you don’t love it and continue to find it valuable, cancel and we will refund the remainder of your subscription.